Friday, July 19, 2013 we boarded the Grand Princess at Pier 35, San Francisco. 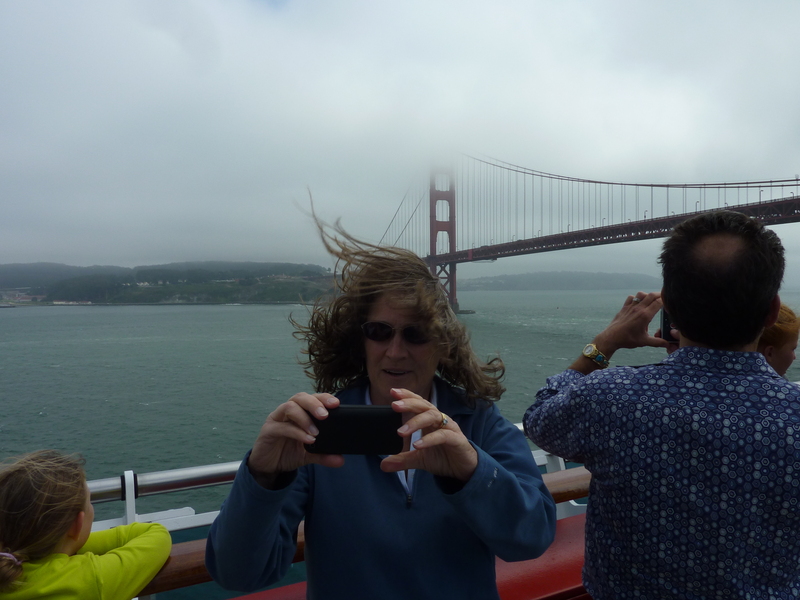 We chose this cruise because of its proximity to our home, only thirty-five miles. The last time we cruised to Alaska we flew to Vancouver, Canada, spent the night, and boarded the ship the next day. We enjoyed it, but it was a bit of a hassle and expensive. If we board the ship in San Francisco, we won’t have any hassles. Nothing is hassle free. The first thirty-three miles took a half-hour. The mile or so along the Embarcadero took an hour. The weather in Dublin was great. I dressed in proper tourist attire, shorts and Aloha shirt. San Francisco was cold and windy. It got worse. Don’t you just love Cathy’s latest hair style? Notice the lack of California sunshine? It got worse, much worse. The winds continued to increase throughout the night. According to disastercenter.com, 80 knots equates to 92.2 miles per hour. Above 73 mph hurricane devastation occurs. Saturday was spent at sea. Heavy seas kept everyone indoors. I didn’t even write. I spent the day eating and reading a novel by recently published author, I.C. Enger. I met her at the Public Safety Writers Conference in Las Vegas. Her book, Blue Ice, is the first in a series. I found the story very interesting, a page turner. Later in the week, I read her second book, Green Ice. The third in the series, Black Ice, is due out shortly. Sunday we docked in Victoria, B.C. just as the weather broke. It was a beautiful day. We’ve been to Victoria several times and have seen most of the sights. It’s a good thing. Victoria was hosting a Good Guys type car show. The theme was Deuce Coupe. We learned that more than a thousand 1932 Ford Deuce Coupes were entered along with another thousand or so vintage cars and hot rods. Several locals told us, “This is the largest event ever held in Victoria.” I believed them. Most of the downtown streets were closed down. Almost all tours in town were cancelled. The open streets were worse than San Francisco. This was the only car not sporting a DO NOT TOUCH sign. 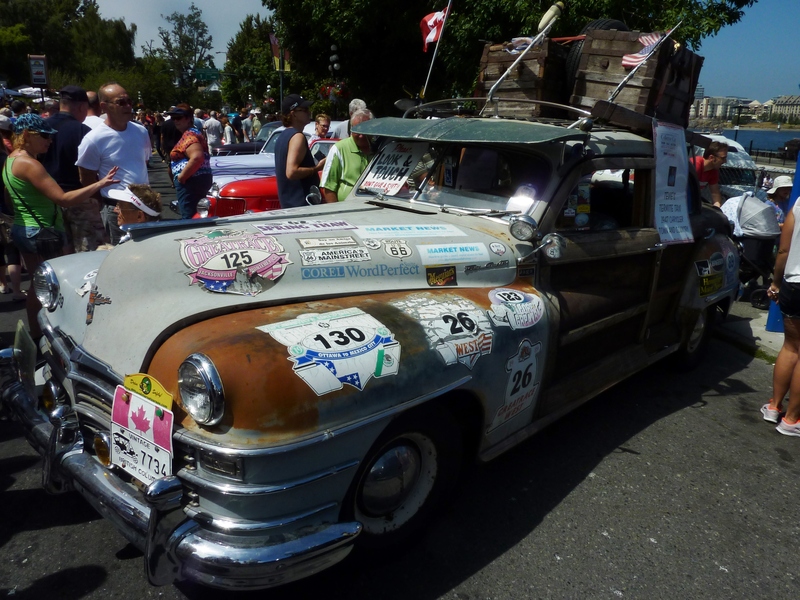 Every car entered in the show, and all the ones parked around town were brought in by ship and ferry. We spent Monday at sea. It was a productive day. There is a library and game area on the ship. Just like at my home office, I couldn’t write in our room. Even though kids and adults play a variety of board games, it didn’t bother me. I rarely hear them, it is a pleasant distraction. Occasionally a group of adults will take over a couple of tables and each tries to outdo the other in volume. These are interruptions and they do bother me. Cathy dragged me away for lunch. I returned in the afternoon. While A Tale of Robbers and Cops is out to an editor, I’m concentrating on my second novel. The story is about police officers working Anti-Gang Enforcement in the fictional city of Liberty, Arizona. It was a good day. I wrote 3700 words. Tagged as 1932 Ford, A Tale of Robbers and Cops, Alaska, Anti-Gang Enforcement, Black Ice, Blue Ice, California, Canada, Deuce Coupe, eighty knot wind, Embarcadero, Good Guys, Grand Princess, Green Ice, hurricane, hurricane conditions, Inside Passage, No Cause for Concern, Pier 35, police officers, San Francisco, Vancouver, Victoria B.C. Rounding the corner and heading for home always brings a change in attitude. Much like the first day of a ride, you want to put on the miles. Our first day on this adventure we rode 440 miles, today I rode 432. Jim and I agreed to ride about half way home and spend the night. Once we hit Redding, California, we knew we were headed home. The weather was iffy leaving Crescent City but we decided against the heavy stuff. We made it about forty miles before we had to stop for bridge construction. It was warming up and it looked like it would be a long stop so I took off my jacket and stowed my sweatshirt. I took a couple of shots of Jim stretching before putting my jacket back on. The camera fell out of my jacket pocket, hit the ground, and broke. There is nothing visible but the viewer remains black. It will record an image but you have no idea what you are shooting. We saw warning signs for Elk. Rounding a gentle curve, I saw a white van stopped in the roadway. Jim braked, and just before he stopped, the van moved away. Wondering what had caused the stop, I scanned both sides of US 101. Grazing in the front yard of a ranger station were at least a dozen Elk. Later, coming into McKinleyville I saw at least forty Elk peacefully munching a farmer’s alfalfa crop. The following picture of the California Coast line was taken blind. At Arcata, we turned east on California 299. 299 is a great ride and we have crossed it several times during Brown Water Runs. I first crossed 299 more than fifty years ago. A freshman at Humboldt State College, I had relatives in Redding. So one Saturday morning I put out my thumb and away I went. Back then 299 was a true adventure, more like a corkscrew that a highway. I think the speed limit was 35 MPH. There were not a lot of warning signs. I got a ride on a loaded logging truck. It was an experience that I would not like to repeat. About a month later, three fellow students and I decided to go to a dance at Chico State College. One of the guys had a cousin who was a student there. According to MapQuest it’s about 210 miles from Arcata to Chico. I know it was further back in 1962. It took us twelve hours each way. With the bald tires on my old Ford we slid across a few curves and off the road once or twice. We slept on the floor at a Sorority house and had a ball at the dance. Chubby Checker was reigning supreme at the time. The only thing I remember clearly was doing the Twist. Cal-Trans is still straightening out 299. We got stuck at a realignment project. We passed a couple of cars on the right and pulled under a tree at the side of the road. The shade made it bearable. The picture was taken with my iPhone. Once in Redding we fueled up and headed home. I-5 from Redding south can be best described as miserable and hot. I wasn’t disappointed. Our next outing is only two weeks away. July 5th is the beginning of the 2013 Brown Water Run. We have over twenty riders confirmed. Jim and I are already forecasting a ride for 2014. The plan is to ship the Harleys to Halifax, Nova Scotia. We’ll fly there and ride down the coast to New Orleans and ship the bikes home. The route is about 3,200 miles. But we never take the direct route. With Jim leading the way, we should cover at least 4,000 miles. Jim has never been to Key West, Florida, and I am always up for a bit of scuba diving at John Pennekamp Coral Reef State Park, Key Largo. With any luck the Phantom will be well enough to join us, and maybe even a few other hardy souls.